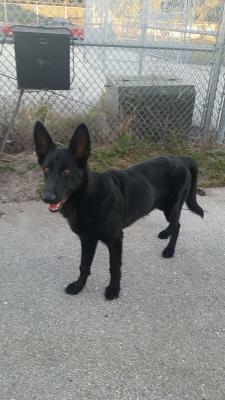 PEPEAKAGAUCHOHASAHOME - Southwest Florida German Shepherd Rescue Inc. He is staying with us. His name has been changed to Gaucho... PEPE IS OUR NEWEST RESCUE. I was going to name him Colt but decided on PePe after I met him as he seems to speak Spanish. He was relinquished by his family yesterday because they said they had no time for him. 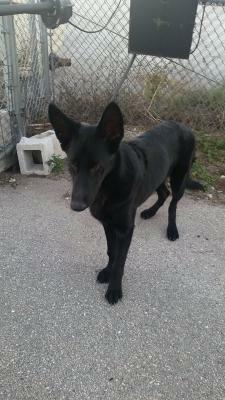 PEPE is an 8 month old black GSD. He is neutered as of 12/7 and was chipped and given his shots. He is HW NEG. From what we know, which isn't much, he is a happy friendly young dog that came from a family that did love him but was forced to relinquish him for some reason, unknown to us. Now that he has arrived in my office I find him to be somewhat fearful but that seems to go away quickly when he is petted and reassured. 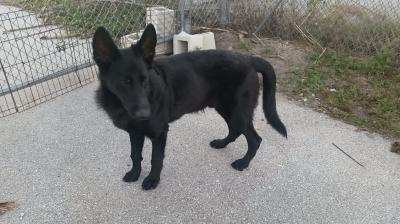 He is not reactive to other dogs and was not bothered by a cat he met at the shelter. He liked the shelter staff but because he is in a super high kill shelter we needed to get him out immediately. We know from a brief test today he is not at all reactive with other barking dogs. He has not been in a play group but rather in an open pen situation separated by a fence. I have very little info on his medical status but he did get his shots and will be chipped when he is fixed tomorrow. He seems housebroken as he peed and pooped outside and was respectful inside. He was fearful of steps but did quite well after we worked with him for a few minutes. We will see what he learned when we go out later. We do have someone looking at him as of Saturday.